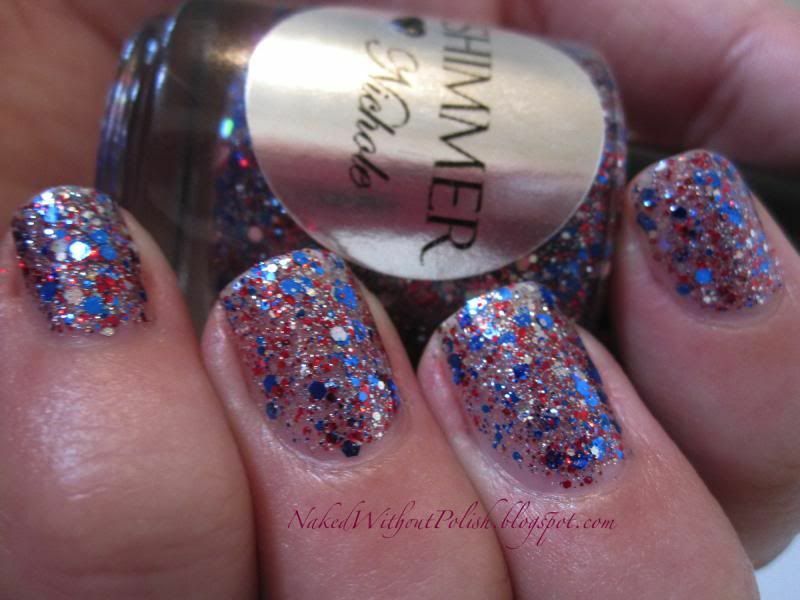 It's day 5 of Shimmer Polish Week and I have the last of the Shimmer Polish beauties for you all. Back with another glitter. This one is more of a top coat, but still looks fantastic on it's own! 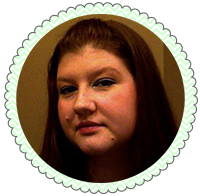 Say hello to Nichole! 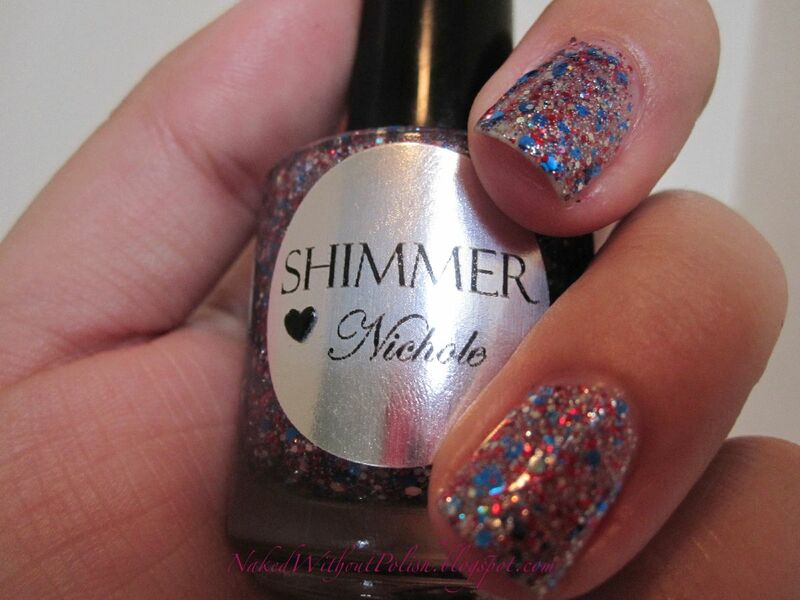 Nichole is a clear base with different sizes of red, blue and silver glitter. This is three coats of Nichole with OPI Natural Nail Base Coat and Glisten & Glow HK Girl top coat. At first, I thought Nichole wasn't going to get along with me. 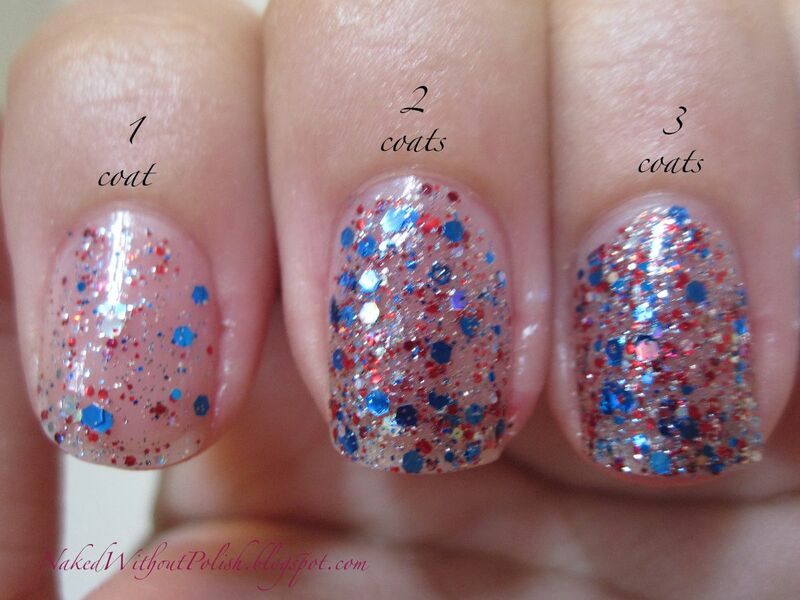 The patriotic polishes are a dime a dozen nowadays (with July 4th being around the corner). I've worked with several. They never seem to really excite me. There was just something fantastical about Nichole once that top coat went on. Absolutely adore this over a naked nail. Coats were nice and thin. The majority of my nails were covered with glitter, but it wasn't completely opaque. I became quite fond of Nichole after this. Application was spot on. Nichole had no issues with the formula getting thick as I was painting my nails. It seems that only 2 out of the 5 had that problem and they were both at different levels of thickness. There was no pulling or blotting of glitter. It was as perfect as a glitter top coat should be. Even though I really prefer Nichole over a naked nail, I still had to show it to you over some undies. 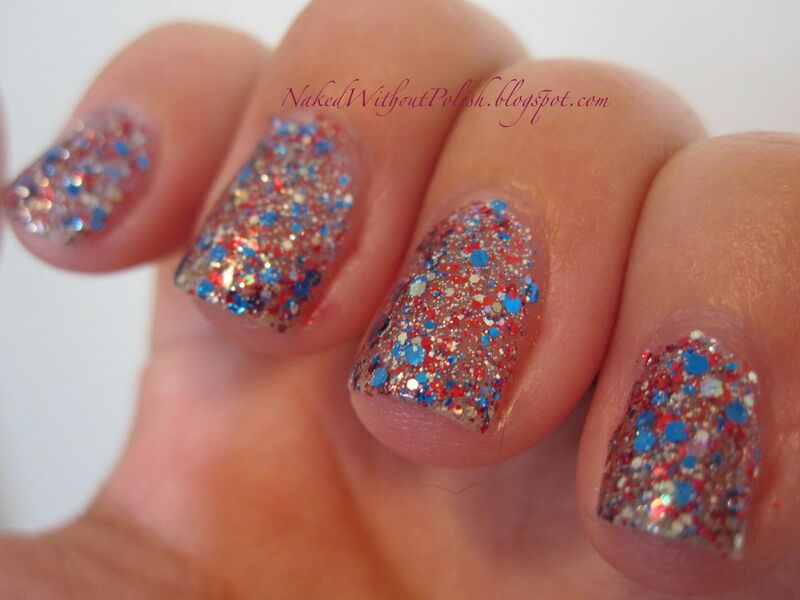 I was going through my Cult polishes and since it is such a basic red and blue glitter I grabbed all Cult Nails polishes to use as undies. This is one coat of Nichole over two coats of Cult Nails - Deal With It. Deal With It is a bright lime green jelly filled with a gold shimmer. To me, green is a natural color to put with red and blue. In the end, it just didn't work. Maybe I should have grabbed Feelin' Froggy. It needed a darker shade of green. This is one coat of Nichole over two coats of Cult Nails - Tempest. Tempest is a pure white creme. Easy pairing! Red, blue, silver... will always go with white. I really liked this one! But it was simple and obvious so of course I couldn't let it be my favorite. This is one coat of Nichole over two coats of Cult Nails - Annalicious. Annalicious is a bright red jelly with red and gold shimmer throughout. I really thought this red was the perfect match. The glitter does look like it has blended in with the undie, but it hasn't. 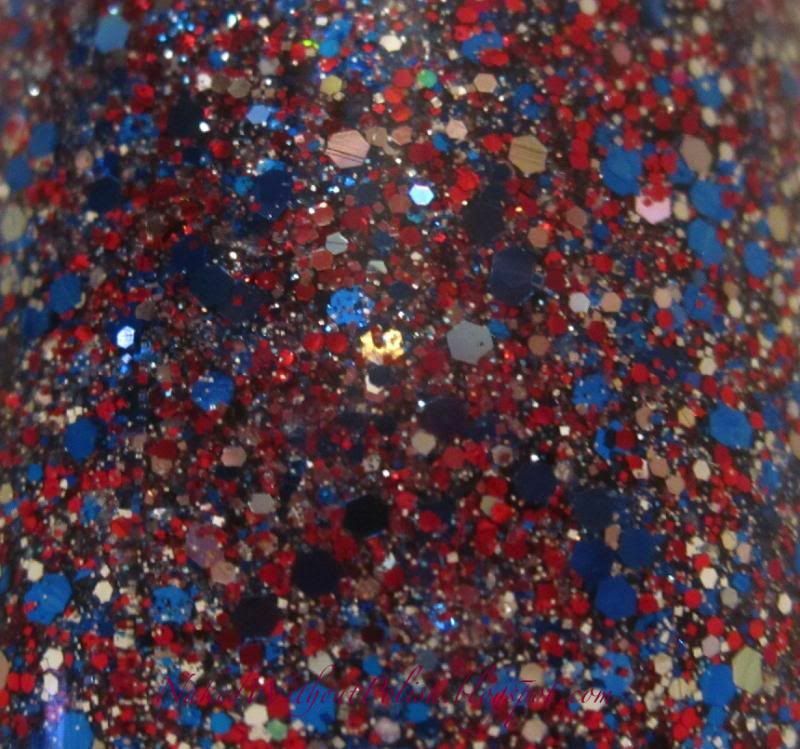 There are specks of the red glitter sparkling on top. I just couldn't get it in this picture. It was highly annoying trying to get a decent picture. This is one coat of Nichole over two coats of Cult Nails - Nakizzle's Shizzle. Nakizzle's Shizzle is a light blue creme. This blue creme was the perfect pairing for Nichole! 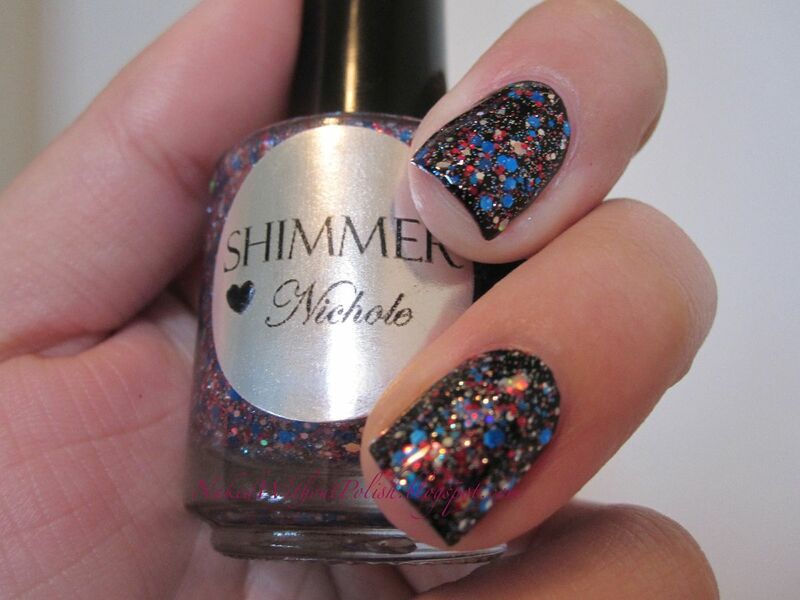 You see every last speck of glitter in Nichole and the blue just helps it shine. It doesn't over power or overwhelm Nichole. It was beautiful. And it didn't even make it look crazy patriotic. This is one coat of Nichole over one coat of Cult Nails - Nevermore. Nevermore is a glossy black creme. This pairing was my absolute favorite. It make Nichole look like it was carrying a universe within the bottle. There's so much depth in just one coat. I was blown away. Of course this is what I picked for my full mani! This is one coat of Nichole over one coat of Nevermore with OPI Natural Nail Base Coat and Glisten & Glow HK Girl top coat. This pairing may have been pretty obvious, but I really loved the way they complimented each other. There you have it. 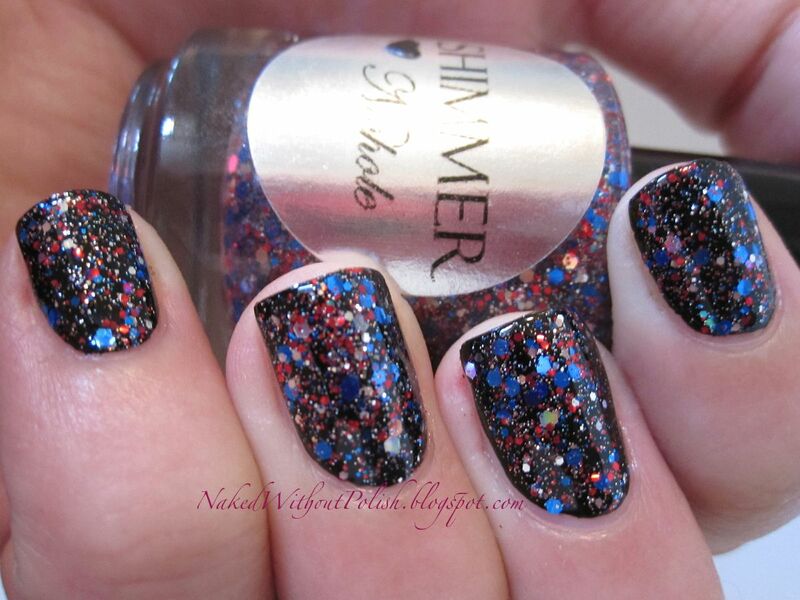 Shimmer Polish Week is now over. :o( I might have to do this again though. I had a lot of fun with this! 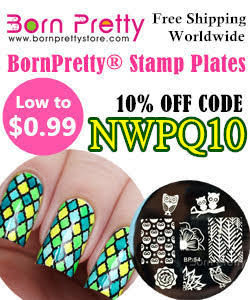 There are so many absolutely gorgeous glitters on her site. It is hard to choose just 1 or a favorite. 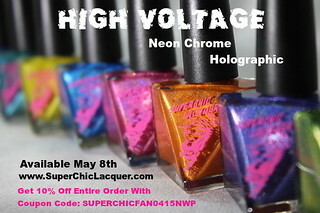 They may only be $12 a bottle, but don't forget about my 10% off code: NAKED, that is good until the end of June 2013!! Also, don't forget about my Gloomy June giveaway that's going on. You can enter here.